Growth form: Parasitic herb. Flowering. Mar–Apr. Status: Native. Common. Also recorded: Bahrain, Kuwait, E Saudi Arabia, UAE. Habitat & distribution: Mainly in coastal areas, including coastal sands along beaches, where occasionally forming small clumps. Host plants include Arthrocnemum macrostachyum, Cornulaca spp, Limonium axillare, and Tetraena qatarensis. Uses: ‘Said to be poisonous’ (El Amin). Rizk & El-Ghazaly describe its use as an aphrodisiac, and a tonic to cure impotence and diarrhoea. 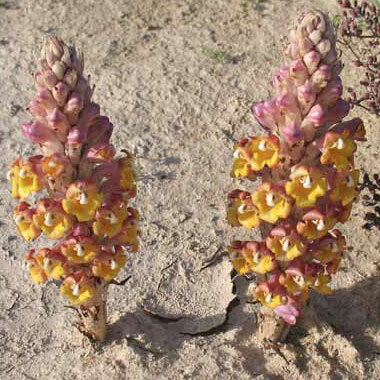 Notes: C. phelypaea is here combined with C. tubulosa; but it is possible that they are distinct but closely-related species and that both occur in Qatar.